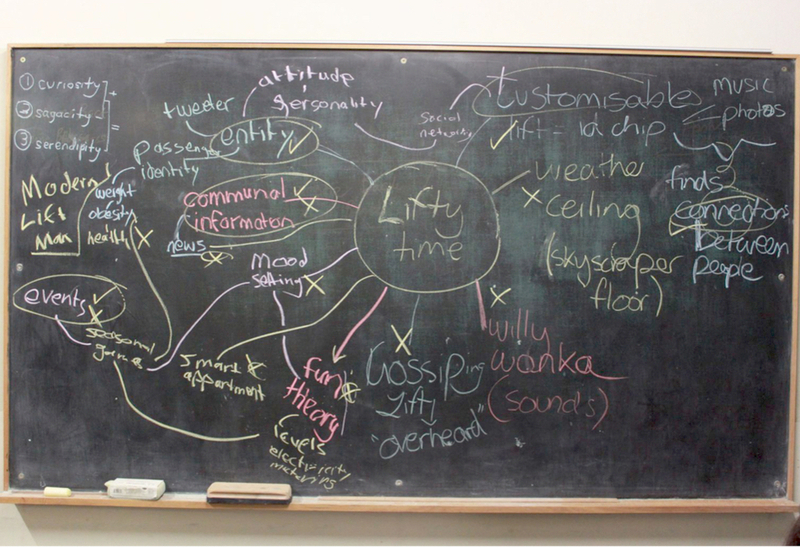 As part of the 2011 OzCHI 24 hour student design challenge, a group of us banded together to address the competition's theme; Designing for Serendipity. The final concept, 'The Curating Lift', was a reimagining of the public (and often awkwardly quiet) elevator ride experience to encourage serendipity. This was the result of a collaborative serendipitous design process into the finer aspects of serendipitous human interactions within humanity and technology. The concept was published in the proceedings of OzCHI 2011 as the winning entry. OzCHI is the Australian branch of the Computer-Human Interaction Special Interest Group. 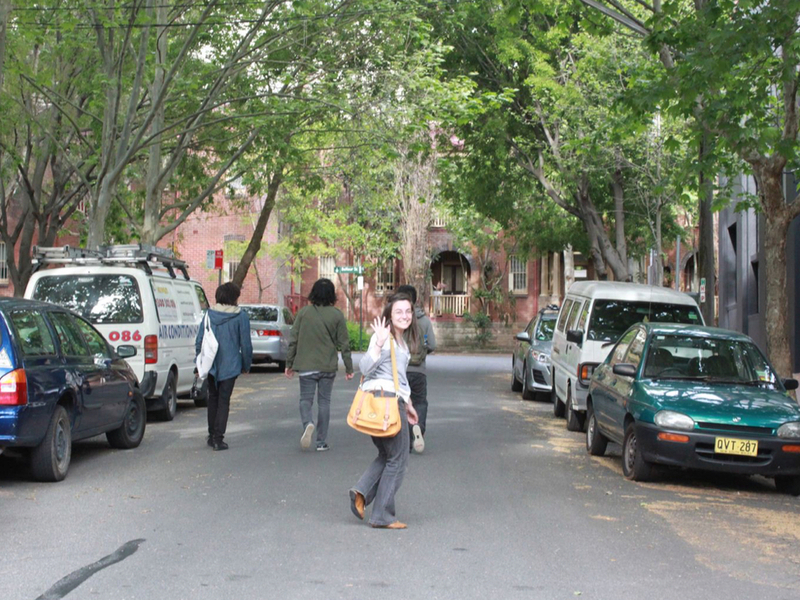 To prepare an experimental space for curating our own serendipitous encounters, we took ourselves on a serendipitous journey around Sydney, utilising the situationist practice of the dérive. Observing the activities of Sydneysiders with a keen eye for isolated experiences that could do with a little serendipitous pizazz, we found ourselves thrust into a cramped elevator with complete strangers, with nowhere to look except down. And it was here that we found our isolated experience that offers enormous potential for serendipitous augmentation: The mundane, awkward elevator ride re-envisioned. But the question was: how could we re-envision this staple of urban awkwardness? Initial Research lead us to the formula (CURIOSITY + SAGACITY = SERENDIPITY). Followed by a few more rounds of user research and conceptualisation until we reached the presented vision of the Curating Lift. During the 24 hours, our live Process Blog preserved the frantic posts of our shenanigans and process! "We are five explorers, fuelled with the passion of web and interaction design, with the singular goal of creating and producing innovative work. We believe that design is about letting your creativity run wild and experiment with the new and outrageous in order to find the right balance between form, function and aesthetics. We are inspired by the way that design affects our everyday life, learning and understanding that good design is about creating something which is intuitive to interact with, easy to learn and a pleasure to use. We love that design is an ever-changing and evolving process which we are continually excited and amazed to be a part of. " – Laura Minchella, Mark C Mitchell, Garry Taulu, Danielle Yu and Hanley Weng. Minchella, L., Mitchell, M. C., Taulu, G., Weng, H., & Yu, D. (2011). The Lift as Curator : A Serendipitous Design Process. OzCHI 2011 Proceedings. The OzCHI24 student design challenge defined isolated experiences as a problem space that can offer potential for serendipitous encounters by redesigning, rethinking or augmenting the experience. To address this challenge we investigated how to successfully design for serendipity and arrived at a crucial equation required for all serendipitous encounters: curiosity + sagacity = serendipity. Gathered research from our own serendipitous journey combined with user research culminated into our concept: a lift that offers an opportunistic space which promotes serendipitous experiences on a case by case basis.